I remember visiting the State Capitol in Michigan years ago, and those old days, we found our state rep crammed into a tiny office on a "half-floor" that we had to access from a stair well. Today, those crazy cramped floors no longer exist with much of the building's interior restored to its original architectural glory courtesy of an early 1990s restoration. You can take a guided tour of the Capitol on most weekdays or take a self-guided tour of the Capitol with the aid of a booklet available online or at the information desk near the public entrance. 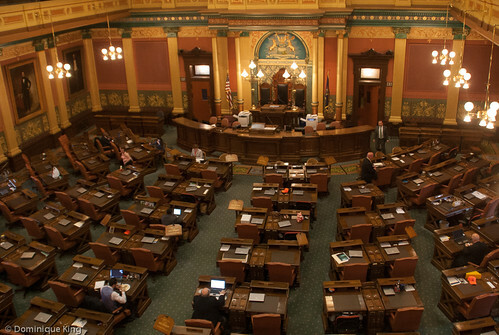 Visitors can see the legislature in action from upper level galleries when the House and Senate are in session, or they can view broadcasts of the proceedings on cable television. We joined Matt VanAcker, director of the Capitol Tour and Information Service, for a walk around of the building on one recent morning, finding his tour a good way to become re-acquainted with the building after all of these years and learn a lot of fun facts that really brought the building's history to life. 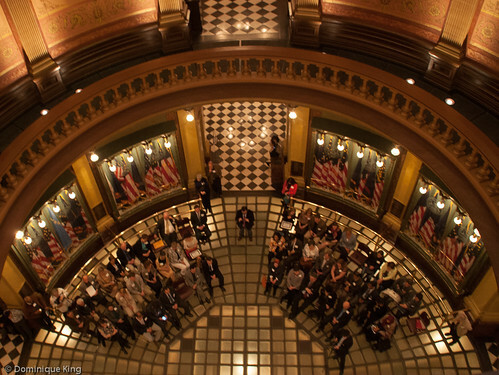 Michigan's current State Capitol is the state's third capitol building, and Lansing became the state's capital city when legislators voted to move it from its original location in Detroit. That first State Capitol in Detroit was a red brick, Greek Revival-style building designed by Obed Wait in the early 1830s. The building had a 140-foot-tall tower, cost $24,500 to construct and started life as the Territorial Courthouse. Michigan's first state constitution in 1835 directed the legislature to pick a permanent capital city by 1847. 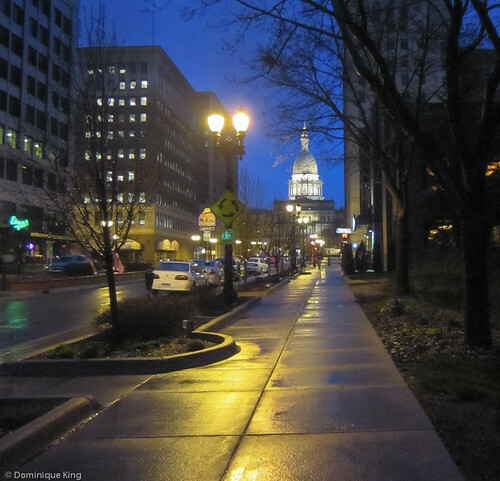 Fierce lobbying by cities that included Detroit, Ann Arbor, Jackson, Marshall and Grand Rapids over Michigan's first decade as a state followed and Lansing, a tiny backwoods settlement at the time, became the choice of legislators. They saw locating the capital away from the Canadian border as wise, making it easier to defend should British forces decide to attack from Canada. The location also made the capital more accessible for much of the population and would boost settlement and the economy in western Michigan. Israel Gillett designed the first temporary capitol building in Lansing as a two-story white frame building with green shutters. This building cost $22,952.01 and served as the state government's home until construction of the current capitol in the 1870s. The first two capitol buildings came to a fiery finish. The Detroit building became a school and burned to the ground in 1893, and the first Lansing capitol building became a factory before it burned to the ground in 1882. 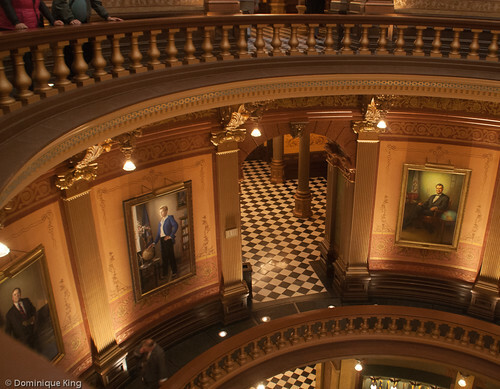 Michigan launched a competition for a State Capitol design in 1871. Architects had strict guidelines and a $1.2 million cap for their designs. The competition drew 20 entries and judges selected Elijah E. Myers of Springfield, Illinois to design Michigan's building because of the simplicity and cost-consciousness of his plans. Myers modeled his design on the nation's capitol in Washington, D. C.
He saw the nation's capitol as a strong symbol of American democracy and unity with its symmetrical design and central dome and added those elements to his design for Michigan. Myers became one of the most prominent post-Civil War architects of public buildings and went on to design capitol buildings for Colorado and Texas. 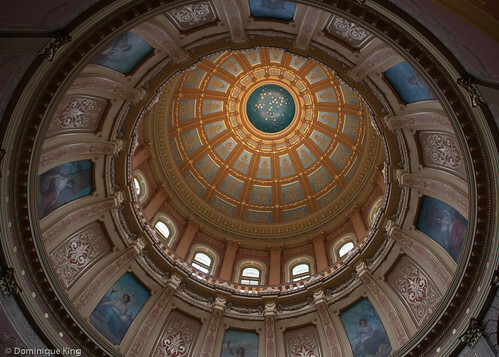 Myers' plan for Michigan's capitol called for a four-story, 139-room building with a 44.5-foot diameter rotunda topped with a 160-foot-high dome. Grand staircases in the north and south corridors of the building led to the upper floors. 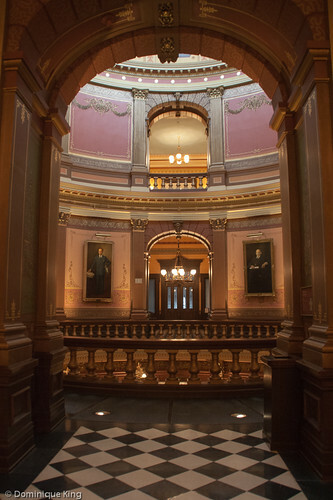 Floors in many public spaces were black-and-white Vermont marble and limestone, while Illinois limestone and Ohio sandstone faced the Neoclassical Italianate-style exterior. The interior of the building looks ornate to modern eyes, but Myers included some clever cost-cutting features. The "marble" columns are cast iron, wood and plaster finished to a realistic-looking faux finish and "walnut" woodwork is a more economical Michigan white pine painted in a wood-grain finish to look like the more expensive wood. Translucent glass floors allowed natural light to help save costs by illuminating lower levels via glass ceilings in larger rooms like the House and Senate chambers. A crowd of 7,000 area residents and 30,000 to 50,000 visitors witnessed the laying of the capitol's five-ton granite cornerstone in 1873. 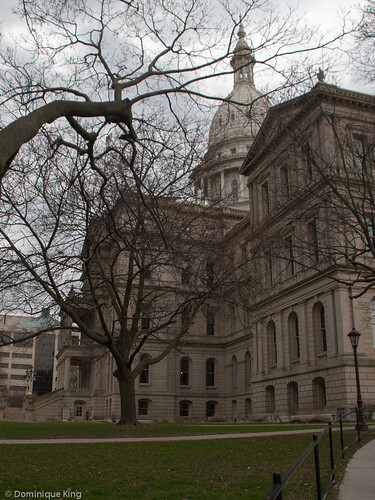 Building construction cost $1,427,743.78 (more than $23 million in 2013 dollars), and Michigan taxpayers footed the bill with a six-year state income tax. The January 1, 1879 inauguration of Governor Charles Croswell also marked the building's dedication. The building earned a place on the National Register of Historic Places in 1971 and became the second state capitol building designated as a National Historic Landmark in 1992. However, the building suffered several indignities through the years. Those who drafted the 1963 version of Michigan's constitution talked seriously about replacing the capitol, and the installation of those cramped half-floors I mentioned to create extra space for offices happened in 1969. The State Capitol managed to survive and officials embarked on an extensive renovation and restoration of the building in the late 1980s. The three-year project, completed in 1992, restored the building to much of its original splendor by getting rid of those infamous half-floors, improving access for the disabled, repainting the dome to match the exterior of the building and refreshing the building's impressive faux finishes and other interior artwork. Today the capitol building houses the two legislative chambers, the Senate and House leadership offices, the ceremonial offices of the Governor and Lt. Governor and few other staff offices. Two legislative office buildings across the street from the capitol building, plus buildings for the Supreme Court and the Michigan Library and Historical Center several blocks east of the capitol, now house many of the government functions once housed under the capitol's roof. What a beautiful building and interesting history. I've visited the Ohio State Capital before but haven't had a guided tour. I just get a bit more out of a visit if I am able to hear the stories that make it interesting from someone else. Thanks for joining the Best of the USA!